Underwater Acoustics - a brief introduction to the topic, with links to more technical material on the subject. Traditionally, a submarine's ability to avoid detection is defined in terms of its acoustic signature. There are many sources contributing to a submarine's acoustic signature. Machinery and other propulsion-related vibrations enter the water through the hull and radiate in all directions. The propeller resonates when turning, and cavitation (noise generated by bubbles collapsing) can develop. Additionally, the turbulent flow of water around the ship can excite the hull itself. Each type of noise has a unique pattern, which can differ with speed, depth, and water conditions. 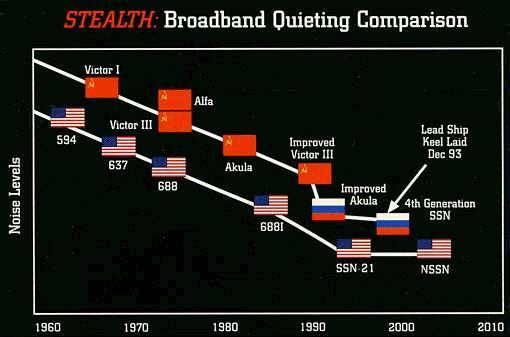 Quieting technologies continue to improve and are increasingly available to backfit older submarines. Hull coatings, improved propeller design, and quieted propulsion plant equipment reduce the submarine's overall noise levels, especially at high speeds. There are a wide variety of noise sources present in the underwater environment, but the main, consistent contribution comes from only a few types. Ambient noise, unlike other sources, does not come from a particular direction or source. The noise level is the same everywhere in the local area. The most obvious contribution to the ambient noise is the action occurring on the surface of the ocean. The greater the size of the waves, the greater the ambient noise contribution. The waves are driven by the winds, so there is a direct correspondence between the steady wind speed and the sea state. The greater the wind speed or sea state, obviously the greater the ambient noise contribution. The frequency of the noise from sea state tends to be greater than 300 Hz. The second main contribution to ambient noise comes from shipping in general. In regions where there are many transiting ships, the ambient noise will be increased substantially. This noise, in contrast to the noise from sea state, will be at low frequency (< 300 Hz). The third possible ambient noise source is biologics, meaning sea-life. These are as widely varied as they are unpredictable. One common source is snapping shrimp. Others include whales and dolphins. Self-noise [SN] comes from the noise from the platform the sonar is on or from the flow of water across the receiving array itself. This self-noise has a minimum value which is present regardless of the speed that the array is traveling through the water, and the self noise will increase due to flow noise and the increase in noise from the platform which carries it. Self noise has a frequency and speed dependence. Passive accoustic sources fall into two main categories: broadband and narrowband sources. Broadband sources create acoustic energy over a wide range of frequencies, similar to a thermal source in electro-optics. Typical broadband sources are noise from either the propeller/shaft, flow noise and some propulsion systems. Noise from the propeller and shaft is generally at low frequency, meaning less than 1000 Hz. The rate of rotation can amplitude modulate the noise, and this propeller blade rate tonal noise can be detected and demodulated to measure the shaft or propeller blade rate. Narrowband sources radiate within a small band about a particular frequencies, or class of frequencies. Typical sources are the various pieces of machinery found in every ship, including example, pumps, motors, electrical generation equipment and propulsion systems. When specifying narrowband sources, it is important to also specify the frequency at which it occurs. Cavitation noise is produced from the motion of turning propellers on surface vessels, submarines or a torpedoes. Cavitation is the formation of partial vacuums in a flowing liquid as a result of the separation of its parts. When these partial vacuums bubbles collapse, they produce cavitation noise, which sounds like a pulsed note and can be heard at considerable ranges, depending on the size of the propeller and the speed of rotation. A torpedo produces a very high pitched and fast rotation noise. Distinctive propeller blade broadband cavitation noise can render a submarine detectable by passive sonar systems. Generally, the level of noise from a ship increases with ship size and speed. The loudest noise from normal ship operation comes from cavitation of the propeller, which adds 10-15 dBA to the noise level of regular operation. When the United States entered World War II, U.S. Navy ships relied solely on active sonar. "We started the war with active sonar, but then reports came in that the Germans were detecting our submarines and surface ships much sooner than we were detecting theirs," he recalled. "They detected our ships not with active sonar, but with passive sonar, which provided longer detection ranges." Therefore, submarine noise had to be reduced to avoid detection. It was hard to convince the propeller designers that the noise coming from the submarine was caused by propeller cavitation, because they had designed the propellers to be non-cavitating. But the type of cavitation of concern to them was cavitation on the propeller blades, which caused a reduction in propulsive efficiency. The cavitation causing the noise was not on the blades but rather a helical string of cavitation in the water trailing behind each tip of the blade, called "tip vortex cavitation." Propellers were subsequently designed to avoid this type of cavitation. But the advent of nuclear powered submarines travelling submerged at high speeds resulted in other kinds of propeller noise. It was determined that some of these new noise sources could be tested with powered model submarines in air, in a wind tunnel. In the 1970s, researchers had a reasonably good understanding of the physics related to the noise radiated by open propellers. A significant amount of data existed which allowed a semi-empirical way of designing hydroacoustically. However, it soon became clear that future submarines would need propulsors capable of propelling our ships at higher speeds and at significantly lower noise levels. The tactical speed of a submarine is that speed at which the submarine is quiet enough to remain undetected while tracking enemy submarines effectively, with sources of self-noise reduced to the point that other submarines and ships can be detected using onboard passive sonar sensors. The the maximum burst speed of a submarine is the highest speed that can be achieved by the submarine's propulsion system, regardless of the self-noise created in the process. In the past, the tactical speed of a submarine was typically significantly less than its burst speed, though in the case of the SSN-21 Seawolf it is said that the tactical speed of 25 knots is a significant fraction of the burst speed of the boat. Much of what has been labeled "Tactical Oceanography" is simply knowing the environment. Water mass characteristics affect sound propagation paths; therefore, knowledge of oceanographic features is imperative. As outlined earlier in the handbook, many complex oceanographic features exist in this area. Ocean fronts, eddies, swift currents, and irregular bathymetry are all present. This section will briefly review ocean features and their tactical implications. The Sound Speed Velocity Profile (SVP) is mainly dependent on the water temperature profile, the SVP gives a snapshot of the working environment. Sound ray paths and resulting propagation loss will differ, depending on the source depth. The most exploitable feature of a SVP is the sonic layer depth (SLD), or the depth of the maximum sound speed, seen in the relation between an AXBT profile and the SVP. The mixed layer depth easily approximates the SLD. A sound source at the SLD will undergo "dipolar spreading" in which the sound intensity decreases by (1/r)4, as r (range) increases. This is much greater than the loss incurred if a target is in a sound channel such as the surface layer. The greater the "below layer gradient" (BLG) of either sound speed or temperature, the greater the spreading loss will be for a sound source operating at, or just below, the SLD. A shadow zone created by the BLG when a sound source is in the surface layer. The existence of a shadow zone and the dipolar-spreading phenomenon argues against placing a receiver in the thermocline or at the SLD. Sound Channels caused by surface ducts, shallow sound channels, or deep sound channels are also exploitable. Deep sound channels (DSC) are often difficult to access yet may prove operationally effective if a receiver can be placed within the mid-three quarters of the DSC. Shallow sound channels may not be geographically widespread, hence not tactically useful. However, they may exist around fronts and provide extended ranges if a sound source is placed in the channel. Sound channels have a cut-off frequency which helps determine their tactical significance. The surface duct cut-off frequency can be determined. If the frequency of interest is above the cut-off, then extended ranges may be expected. Frequencies twice the cut-off frequency are more reliably ducted. Frequencies below cut-off will not be ducted. Ocean Fronts will vary the SLD, BLG, and the horizontal gradient. Bearing errors occurring due to horizontal temperature gradients may result in erroneous acoustic predictions. The sound isospeed lines in a front exhibit very steep isospeed slopes, particularly in the first 1000 feet. The downward refraction of the sound rays can often increase multipath detection, such as bottom bounce, to the south of the front. Ambient noise may be increased in the vicinity of the front due to increased biologics. Sea state may alter dramatically as a result of intense atmospheric mixing and instability (i.e. North Wall Effect), causing higher wind speeds, higher sea state and increased ambient noise in the area. Prosecuting a target through a front requires flexibility in tactics. Changes in the SLD, Deep Sound Channel Axis (DSCA), and ambient noise influence the operator's choice of receiver depths. Ocean Eddies are best conceptualized as circular fronts, also affecting the SLD, BLG, and DSCA. Warm core eddies are found to the north of associated currents and cold core eddies are found to the south. In the perturbed zone, warm eddies may exist next to cold core eddies. With warm core eddy's isospeed lines, the SLD deepens in the center. The SLD changes are dramatic and operationally significant. A sound source in the center of the warm eddy will have good direct path ranges because of the increased likelihood of ducting. However, detection across the eddy's edge may only be possible through CZ and bottom bounce propagation. With Cold core eddies isospeed lines, the DSC shallows, becoming more accessible. A cold core eddy is an acoustic "lens", betraying targets trying to seek refuge within the eddy. Because cold core eddies are generally found south of currents and contain denser water than the surrounding waters, they tend to sink. The surface of the eddy warms due to insolation, making them indistinguishable from the surrounding water when viewed from the surface. This is significant as they will not be detected by SST analysis or infrared satellite imagery. Warm core eddies, being less dense, can be detected for longer periods. Perturbed Zones exhibit considerable complexity. In this region, an operator must be aware of the environment likely to be encountered. Surface temperatures may mislead tacticians as to the significance of an ocean front. This region has cold and warm intrusions, which often separate into, eddies. Southward flowing subarctic waters undercut northern warm eddies and intrusions. This increases the BLG, decreases the SLD and DSCA and intensifies the below surface fronts. Topographic Effects with upslope and downslope enhancement depends upon the slope of the ocean floor. Sound rays transmitted up a moderately steep slope will display increasing arrival angles with each bottom interaction, thus increasing chances of multipath detection. Downslope enhancement relies on sound rays propagating down the slope, eventually transforming from a bottom bounce to a deep sound channel propagation.